If your WordPress theme doesn’t offer a feature to add social icons in your widgets, like in your footer or sidebar, and it doesn’t even have Font Awesome integrated, then you’re on your own. You’ll have to either add social icons manually or use a plugin. Whenever possible, I like adding things manually, so I won’t add another plugin to the cluster (the fewer plugins, the better), but it can be a hassle for some people, especially for beginners. So, let’s start with the manual part first, and then we’ll get to the plugin part. Let’s take Facebook as an example. Go to their official Brand Resource Center, read their guidelines and then choose what icon would you like to use. For our example, I picked the one that’s usually used for social icons, the “f” logo. 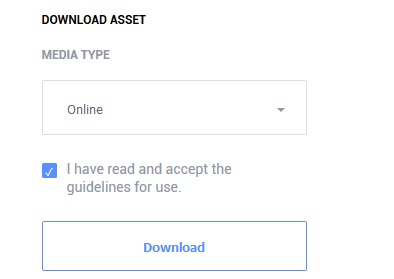 To download that, scroll down a bit until you see Download Asset, on the right side. Choose the Media Type, accept their guidelines and press Download. You’ll receive a .zip file with the logo. You’ll have .png, Adobe Illustrator (.ai) and Adobe Photoshop (.psd) files. We’ll just need the .png logo for our example. They come in different sizes and styles. I’ll choose the blue one that’s 50x50px in size. Then paste the below HTML code in the Text tab of the widget, not the Visual one. In that code, you need to replace http://yourdomain.com/wp-content/uploads/2017/08/FB-f-Logo__blue_50.png with your actual image link. Here’s how you can find and copy an image’s URL. And, of course, also change https://www.facebook.com/your-page-name/ with your actual Facebook page link. Now I’ll also add Twitter and YouTube icons, so you can see how it looks when you add more than one. Make sure you add the codes inline, one after another, like you see in the image, otherwise the icons won’t stay aligned well. They look pretty neat, huh? Now the code will be displayed in the Text tab of your post or page. The only extra thing that you need to do is to add target="_blank" (highlighted in yellow) to the code because you don’t have that option in WordPress by default. What that does is to open your link in another browser tab when the user clicks on it, otherwise it will load in the very same tab, and the user will have to click “Back” to see your website again, if they’ll click “Back”, and not just forget about your website. Now you can copy the code and add it in a Text widget, as you saw above. 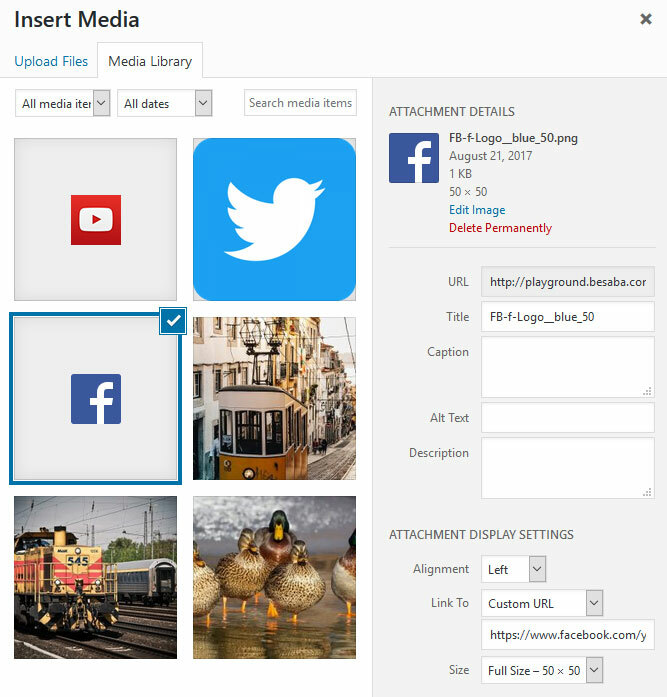 An easier route is to use a plugin, of course, and that plugin is called Social Icons Widget by WPZOOM. The plugin has a lot of cool features, which you can see in their video and on their website. It allows you to add links to your icons. It pretty much covers anything that you’ll need when it comes to social icons.